This was the first set of projects I did involving the Raspberry PI boards. The second was a true random number generator. The entire desire to do this came about from reading about building a Stratum 1 clock using a Raspberry PI at http://www.satsignal.eu/ntp/Raspberry-Pi-NTP.html and from the use of a Sony radio clock to provide WWVB pulses from the WWVB receiver module that was used in the radio clock. However, all of the projects and examples I found used Linux which I did not really want to use. I much preferred to use NetBSD, but it lacked a number of critical features that would be required to make a properly working Stratum 1 clock. Interrupt support for the GPIO pins was needed and adding a PPSAPI driver that could be triggered by a GPIO interrupt would be necessary. 1_kern-51676.tar - This is the original patch set that adds support for GPIO interrupts on a Raspberry PI, adds a gpioirq driver, adds a gpiopps driver and adds enhancements to the gpio framework to allow for events. 2_fix_kern-51676.tar - This is a set of patches that will actually let the system build correctly. This will teach me to not test compile the system before submitting changes. 3_fix-rpi3.tar - This patch adds a change to bcm2835_bsc.c to deal with not attaching one of the bcmbsc devices on the RPI3. Apparently it is used internally and you are not suppose to mess with it, however it is not clear that this patch is really needed and I only use this on my RPI3 devices. 4_fix-dsrtc-dev.tar - While doing the work on the clocks I noticed that the Maxium 1307 RTC and its friends provide for a bit of battery backed up memory. However, nothing is created in the /dev tree and this patch set adds support for /dev/dsrtc0. 5_enhance-gpiopps.tar - This patch set builds on the original kern/51676 patch to add support for the clearing edge if you wire the pps signal to two gpio pins. This works by triggering two interrupts, one on the rising edge and one on the falling edge and is required to get the WWVB clock to work with radioclkd2. The 6th patch is used with the True Random Number generator project. 7_gpio-mpsafe.tar - It is likely that the gpio interrupt handler is actually MP safe, so do that. This builds on patches #1 and #2. This work was done in the 7.99.56 time frame, but the patches still apply with some fuze to the 8.99.3 kernels. Three clocks have been built. 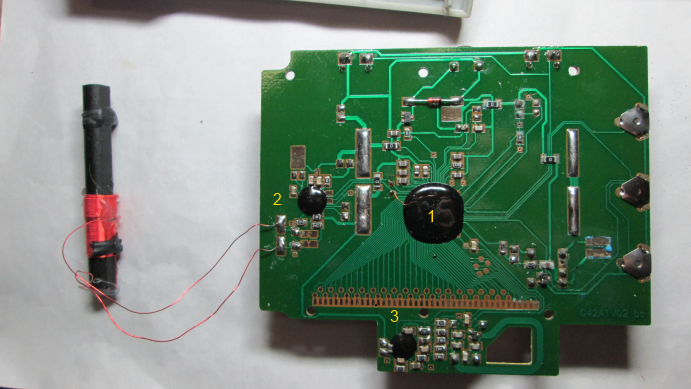 Clock #1 is a GPS clock with PPSAPI support that mirrors in most ways the one found at Satsignal.eu. Clock #2 uses a WWVB receiver module to receive pulses from the WWVB VLF signal originating from Fort Collins, Colorado. The pulses are decoded with a modified radioclkd2 and fed to ntpd. Also, a PPSAPI source is provided that is also used by ntpd. Clock #3 is also a GPS based clock but uses a different GPS chip and different Raspberry PI model than Clock #1. The first clock that was built uses a GPS module to acquire the rough time from the GPS satellite signals and then adds a PPS source to get an accurate second. Raspberry PI 2 V1.2 running NetBSD 8.99.3 with the above set of patches. A Sparkfun Venus GPS module. The Venus module is looped back to the RPI2 via a FTDI USB port. In addition a DS1307 RTC was added and a Onewire temperature sensor was added to keep track of the external temperature inside of the box that everything is sitting in. Later the 5V power supply was replaced with a POE arrangement. This consisted of a POE splitter from POE Texas that provided 5V output direct to a micro USB connector. Sparkfun has a PDF of the binary messages used by the Venus GPS module. It will need to be consulted to find out the commands that are to be sent. venus_command.pl - This will take a Venus command and optional data block and output either an ASCII or binary representation of the command string that will need to be sent to the Venus GPS module. The ASCII representation can be used by venus_gps.pl to send commands to the module. venus_gps.pl - This is the main useful helper command. It will take any number of ASCII venus commands and send them to the device. There is support for trying to detect the baud rate of the module and support for the detection of the "change baud rate" command so that it can speed shift to send more commands. venus_hex.pl - This will take a binary Venus command blob on STDIN and output an ASCII representation. venus_ready.pl - This will sample a GPIO pin looking for state transitions. It is used upon boot up of the RPI to determine of the Venus is ready. It was found that better ntpd behavior will result if the Venus module is ready and getting time before ntpd starts. venusgps - This is a NetBSD rc.d file that can be used to execute the venus_gps.pl command with arguments. venusready - This is a NetBSD rc.d file that can be used to wait on boot up until the Venus GPS is ready. clocksched - This is a NetBSD rc.d file that will changed the schedule queue for ntpd and radioclkd2 to use real time scheduling. Doing this helped ntpd somewhat in Clock #1. GPIO pin 24 and 26 is the PPS source from the Venus GPS module. They are duplicated so that the gpiopps driver can use an interrupt on the rising edge and the falling edge, thus giving the ability to detect the both the assert and clear with PPSAPI. The ATOM driver in ntpd really only needs one edge to function correctly, so it is a bit redundant to provide both. GPIO pin 27 is tied to the NAV ready signal from the Venus module is used to determine if the Venus module has found enough satellites when the system is booting up. It may have been possible to read the PPS source pins for this purpose, but that pulse is quite short and it is possible that it might be missed by the perl code while the NAV signal is quite long and simple to detect if it is coming on and going off. It was found that using $GPGGA sentences at 115200 with a 10Hz update provided the most stable output from the Venus module and did not overburden ntpd. 20Hz was also tried but it caused strange jitter behavior probably due to over running a buffer somewhere. Also the slower update rates were also looked at and they did not perform as well as 10Hz. Likewise the default 1Hz update rate was tried with 115200 baud and it did not yield a significant amount of additional stability. The NEMA reference clock driver can leverage the PPSAPI source on its own, however, I found that was not stable, so what was settled upon was using the NEMA clock for the rough time and the ATOM reference clock for the precise second. The second clock was driven by an interest in trying to pull a reference clock from the WWVB VLF signal. There are a number of places on the Internet that talk, more or less, about doing this. Further, I also had a Lacross radio clock that had mostly stopped working due to the alkaline batteries leaking at one point. Obviously the ASIC or processor used to run the whole thing. The WWVB module, mostly figured out because that is what the antenna is connected to. The UHF module that receives temperature and humidity from a remote unit. This resembles some of the FCC filing documents that were submitted by Lacross, but it is still a guess. Other research on the Internet showed that the WWVB modules tended to provide pulses that were 200ms, 500ms, or 800ms long via a data line and had a control or enable line that would be held high or low to enable the WWVB receiver. It was noted that on the Lacross clock there were two lines running from the WWVB module to the ASIC, so there was hope that the Lacross was using some sort of "standard" module. It would not really matter what module type it was as long as it was providing some sort of pulse output that corresponds to the WWVB signal. To test for this I needed a oscilloscope and chose to get one of the inexpensive DSO138 kits that are sold on Amazon. A word of warning... I purchased the DSO138 kit fully assembled from a vendor on Amazon. However, I did not know until I received the kit that it was actually counterfeit. The scope works just fine, but it is probably best to avoid counterfeit items on Amazon for any number of reasons. Once the scope was hooked up to the suspected lines of the Lacross clock and power was applied to the clock, I was unable to find a signal that matched anything that I had found out about the WWVB modules. It is entirely possible that the Lacross used such a module and that the clock had been damaged enough from the battery leaking that it would not function, or it is possible that the module does not act like the other modules or that the lines I found are not the right ones. In any case, I ended up using a WWVB receiver module from Universal-Solder eBay or the main site. Raspberry PI 0 V1.2 running NetBSD 8.99.3 with the patches mentioned above. The WWVB receiver module purchased from Universal Solder. 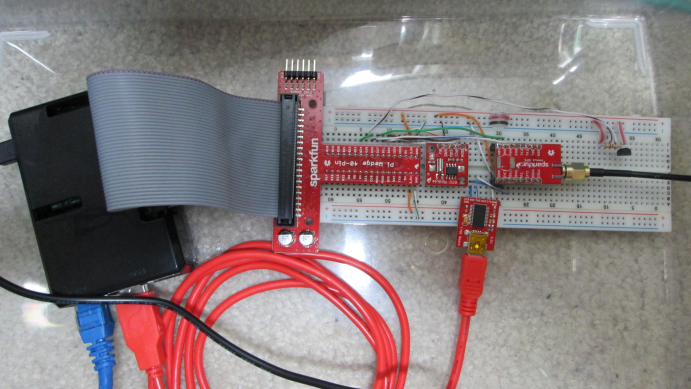 A Sparkfun breadboard power stick. This was needed as the voltage drop from the RPI0 to the receiver module proved to be too much and caused drop outs in the data. The module has pretty flexible power requirements that it may have been possible to power it with 5v from the RPI0. However, that would have required some sort of voltage converter to make the data lines safe for the RPI0 and that seemed to be more trouble that it was worth. In addition a DS1307 RTC was added and a Onewire temperature sensor was added to keep track of the external temperature inside of the box that the RPI0 was in. Later a 12V POE splitter was added. The 12V was sent to a "buck" DC-DC converter to produce a clean 5V. These converter are often used in automobile applications and are easily available on Amazon.com. The voltage on the one I used is variable and good for 5amps or so. I found that it was not possible to split the power from the POE splitter and send 12V to the power supply for the WWVB radio. The issue was not so much the power, but the RF noise that was being carried up the cable. An attempt was made to put a DS1307 inside the enclosure with the WWVB receiver module. However, the DS1307 generated too much RF noise. A DS3231 was also tried, but its use caused problems. The DS3231 is a more accurate RTC which also features a temperature sensor. Something in the way NetBSD accesses the device caused a lot of excessive drift and jitter when trying to process the pulses from the WWVB radio module. This is the WWVB receiver module and its power supply. This is connected to the box with the RPI0 in it by a piece of CAT6 twisted pair. At 19:00:00 radioclkd2 should have reported 2017-070 00:00, that is midnight UTC is a new day, not 2017-069 00:00 which is midnight UTC for the previous day. A compensation was put into the code to increment mday when minute and hour were 00:00. This likely leaves a hole for the end of the year, but fixes it for the common case. wwvb_ready.pl - This is mostly just the venus_ready.pl script from the GPS clock, except for some changes in output messages. radioclkd2 - This is a NetBSD rc.d file that will start the radioclkd2 daemon. wwvbready - This is a NetBSD rc.d file that will wait until there are pulses coming from the WWVB receiver. wwvbenable - This is a NetBSD rc.d file that will set the GPIO pin to enable the the module. I intentionally arranged for the enable pin to be pulled high as soon as possible and to have the module enabled later. GPIO pin 26 is tied to the enable pin on the WWVB module. An active low on this pin will enable the module while a high will disable it. Pins 20 and 21 is the pulse signal from the module and these are used by gpiopps to detect the assert and clear edges in radioclkd2. 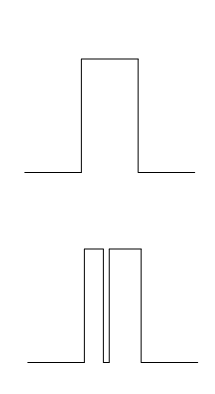 Both the assert and clear edges are required to allow radioclkd2 to measure the width of the pulse. Pin 17 is also the pulse signal and is fed to another instance of gpiopps to provide PPS input to ntpd. radioclkd2_flags="-s timepps -t wwvb -L 0.07 -H 0.07 -v /dev/gpiopps0:-dcd"
Please note that the -L and -H arguments to radioclkd2 was added by my patches to allow for more tolerance in the pulse width. It was also noted that radioclkd2 would not decode the pulses unless it was told that they were reversed and it is unexplained as to why this is required. The clocksched rc.d file knows how to set the scheduler to be real time for both ntpd and radioclkd2 and was used to give the highest priority possible to radioclkd2 and ntpd. When NetBSD was upgraded on clock #2 to 8.99.3 the firmware for the device was also upgraded. Either due to changes in the NetBSD kernel or changes in the firmware considerable drift and offset problems started to occur. After messing around I stumbled upon a stable arrangement by reducing the CPU clock speed from 1GHZ to 700MHZ. This resulted in a very stable clock arrangement, more so than the previous 7.99.56 kernel and previous firmware, with only a modest offset from Clock #1 and Clock #3 and the rest of the world. It should also be mentioned that running the RPI0 at a lower CPU clock rate also caused it to run considerably cooler, so it is also very possible that the SOC is more unstable at the higher CPU speeds due to temperature problems. 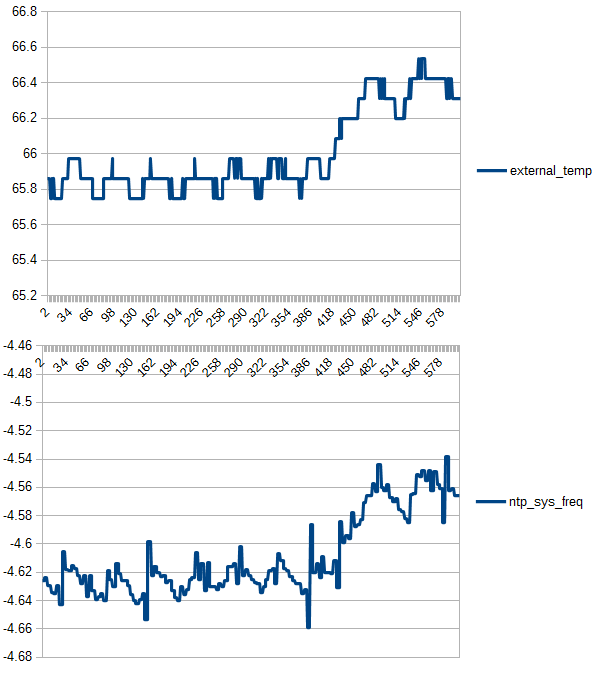 The temperature reduction of a RPI3 running at a reduced clock was not nearly as big. The third clock that was built uses a GPS module to acquire the rough time from the GPS satellite signals and then adds a PPS source to get an accurate second in the same manor as Clock #1. Raspberry PI 3 V1.2 running NetBSD 7.99.56 with the above set of patches. A Adafruit Ultimate GPS HAT. The HAT model of this GPS chip was used because the stand alone breakout box appears to be consistantly unavailable. The GlobalTop module is looped back to the RPI3 via a FTDI USB port. 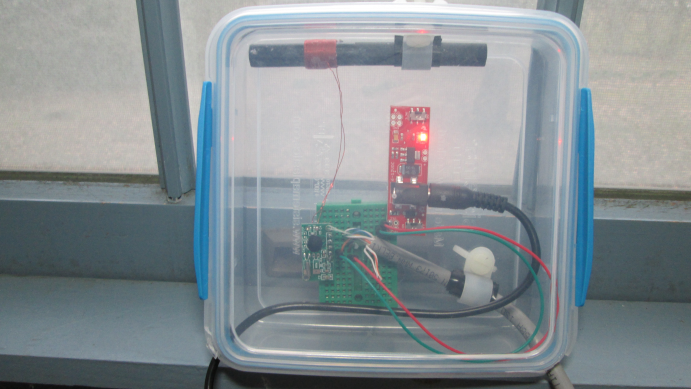 In addition a DS3231 RTC was added and a Onewire temperature sensor was added to keep track of the external temperature inside of the box that everything is sitting in. The HAT comes with a bit of EEPROM that I fiddled with a bit, but was never able to get presented to NetBSD without locking up the I2C bus it was on. The EEPROM is suppose to be used to auto configure the HAT, but I really was not interested in how the device wanted to be auto configured. The EEPROM appears to be 4k long and the write pin is tied in such a manor as to make it read only, but that should be easy to change if one wanted to. The DS3231 comes with a build in sensor for temperature that is presented to NetBSD just like any other sensor of that sort. It was a lot simpler getting the GlobalTop GPS module stable than the Venus module used in Clock #1 mostly because of the experiences learned in creating Clock #1. The programing command language of this module is much simpler, but a set of helper scripts were also developed for it. Adafruit has a set of PDFs that will provide the command and optional arguments used by the module. This will have to be consulted in order to know what the commands mean. gtop_gps.pl - This is the main useful helper command. It will take any number of ASCII GlobalTop commands and send them to the device. There is support for trying to detect the baud rate of the module and support for the detection of the "change baud rate" command so that it can speed shift to send more commands. venus_ready.pl - This was reused from Clock #1. The GlobalTop PPS pulse is a lot wider than the Venus PPS pulse and it is possible to sample it directly rather than pulling the NAV ready signal. gtopgps - This is a NetBSD rc.d file that can be used to execute the gtop_gps.pl command with arguments. venusready - This is a NetBSD rc.d file that can be used to wait on boot up until the GlobalTop GPS is ready. clocksched - This is a NetBSD rc.d file that will changed the schedule queue for ntpd and radioclkd2 to use real time scheduling. 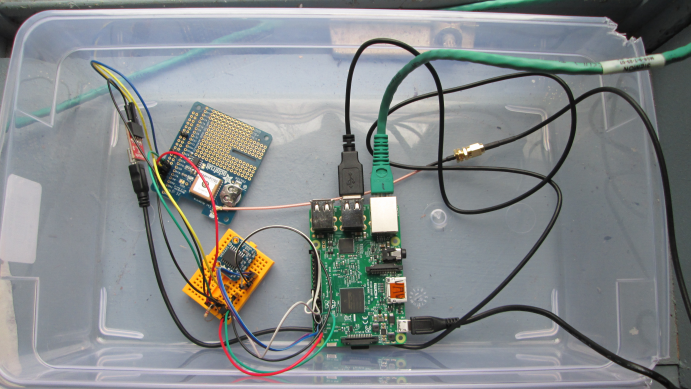 GPIO pin 21 is the PPS source from the GlobalTop GPS module. There is no particular need to provide the clear PPSAPI signal as the ntpd ATOM driver only uses one pulse edge. As mentioned, the PPS pulse width of the GlobalTop GPS module is wide enough to sample directly to see if the module is alive and has acquired enough satellites. gtopgps_flags="--device /dev/dtyU0 --find-baudrate --send-command --command 251,115200 --command 314,0,0,0,1,0,0,0,0,0,0,0,0,0,0,0,0,0,0,0 --command 185,0 --command 225,0 --command 220,200"
It should be noted that the GlobalTop module supports the $GPZDA sentence, but the documentation does not mention that. I could enable it with the command 314,0,0,0,0,0,0,0,0,0,0,0,0,0,0,0,0,0,1,0. There also appears to be some support for the logging sentences and in fact Adafruit appears to sell a logger that is based upon this chip and I suspect uses these sentences. Not as much experimentation has been performed with respect to the best NEMA sentences to use and the best rate to use them. What has driven experimentation is the issue mentioned later with respect to the likely firmware crashes. I ended up settling upon the $GPGGA sentence at 115200 with a 5Hz update rate. 10Hz was also tried and either appear to work pretty much the same as was the use of the $GPZDA sentence which also did not provide anything additional. It was noted that the default of 9600 baud proved to be less stable. In my estimation, this clock works well. Since the clock was created and finally made stable I have sampled it against other Stratum 1 clocks on the Internet. The results are that it keeps the time to within a small number of microseconds as compared to others. By one definition, this would be considered good. From samples taken every minute, it has been noted that the sys_jitter is nearly constant at 0.001907 and clk_jitter and clk_wander nearly always the numbers above +-0.001. The rootdisp is also quite low. The only comment one might make is the precision which is -19, or 2^-19, which is quite good, I think. There is a specific issue with the GPS based clock that has been noted. The system frequency varies depending on the temperature of the room. The heat in the room came on at the time when the frequency started to drop. Apparently the clock likes to be warm. 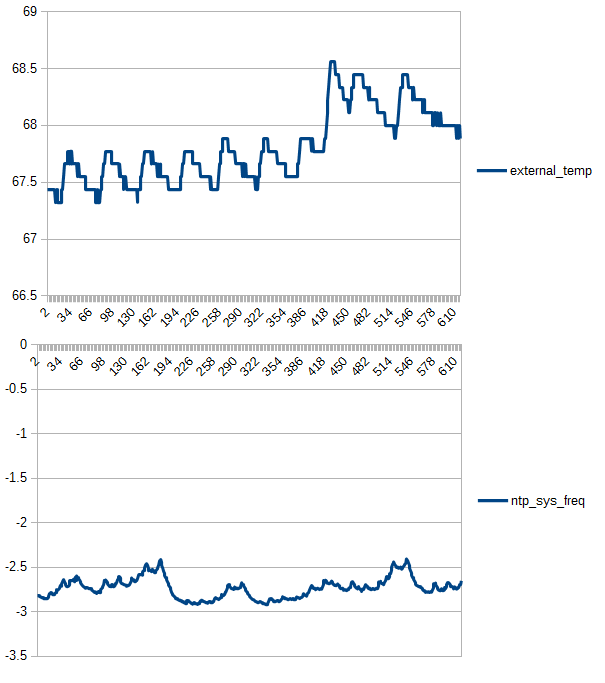 A second temperature related issue is that the CPU temperature goes go up in the RPI2 as it does more work. Adding the clearing edge, and changing the process scheduling of ntpd caused a couple of degrees of increased CPU temperature. This has not proved to be a problem in the cooler months, but we shall see it is becomes a problem later. The temperature of the CPU runs around 102 or 103 degrees F all of the time. It has also been observed that Clock #1 will sometimes prefer his peer, Clock #2 for the rough time. This situation is not fatal, as it does not last for very long. The only odd side effect is that if another system is pooling for time at the instant this is happening it will find that the stratum level of Clock #1 has changed and probably note some differences in the clock metrics. Clock #1 is also effected when heavy access occurs to the SDCARD. These graphs illustrate some of the effect. The two spikes occurred when the daily cronjobs that run by default in NetBSD were executed. This spiking behavior was much worse when the process scheduling was not set to real time, but can not be eliminated completely. Note that the second graph illustrates a read via the PPSAPI, and hence is not related to the USB serial interface. In my estimation, this clock pretty well as long as it has a good signal from Fort Collins. With a good signal, it maintains a small number of microseconds difference between itself and other Stratum-1 clocks on the Internet. When the signal is poor, this clock can get much worse. The single biggest issue appears to be the nearly uncountably large number of noise sources that will mess up the pulses. I also capture samples every minute from this clock and note that the sys_jitter ranges all over the place. On this particular day, it ranged from 0.3139 to 16.1240. The other counts, clk_jitter, clk_wanter and rootdisp also wander around. The precision is noted as -18, or 2^-18. This is not awful, but also not as good as the GPS based clock. It is also entirely possible that the situation would improve by using something other than a RPI0. Further the CPU temperature stays around 96 or 97 degrees F. The thermal mass of the RPI0 is much smaller than the RPI2 and it is not enclosed in a case, which might be a factor. 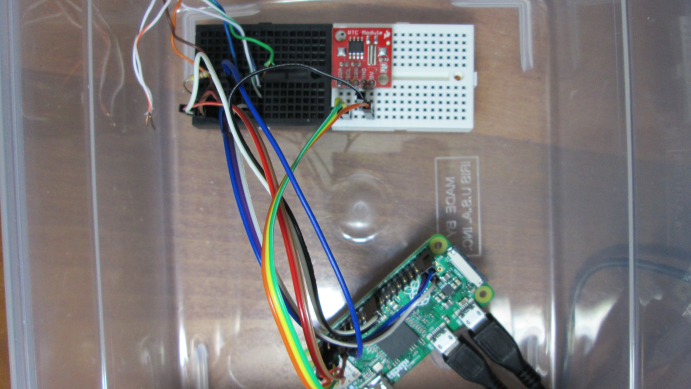 However, it is unclear in the GPS case if the temperature change is due to the RPI2 warming up or the GPS module. The recovery of the pulse when the signal is less then perfect with radioclkd2. While there is a bit of recovery code in radioclkd2 it can not recover from what I call the "brief dropout". The top is what a pulse should look like, the bottom has experienced a drop out. What this looks like to PPSAPI is another pulse and this has a tendency to confuse radioclkd2. Signal reception is very bad if there is bad weather anywhere near my location, with near meaning anything within a large number of states around my location. There also tends to be a lost minutes in the afternoon, but if it was a good day for the WWVB signal, then this really isn't much of a problem. It also also been observed that it is possible to lose the rough date and time decoding, but still have fairly good second decoding. This results in Clock #2 getting it rough time from its buddy, Clock #1, and the seconds from the PPS signal. An attempt was made to implement a WWVB decoder in perl with the goal of being able to add better pulse reconstruction, but it proved to be too slow. Further the lack of any sort of direct support for PPSAPI natively in perl made it hard to use. As a test it would work on static files that contained the pulse information from PPSAPI, but could not sample the pulses fast enough to make it workable when attached to a real live source. This effort will probably be revisited when I have more time. A second issue was that ntpd appears to crash once in a great while. This was dealt with, crudely, by having a cron job run from time to time to make sure that ntpd is actually running and restart it if it is not running. It appears, on the surface of things, that ntpd quits more often if radioclkd2 is having trouble decoding time. If ntpd restarts and radioclkd2 has not acquired good time there is every chance that time keeping will become unstable. Most of the time, Clock #2 will recover from a restart of ntpd with bad receive conditions if good pulses and decodes are provided. However, it was noted that sometimes the ATOM driver will not manage recovery and ntpd had to restarted. There may also be an issue with radioclkd2 if it has been running for a while. It has been noted that while it was able to decode the pulses, the PPS offset in ntpd was wildly outside of its normal values. Stopping and starting raidclkd2 dealt with the problem and this was included in the crude cron job check for ntpd mentioned above. Unlike Clock #1, Clock #2 does not appear to suffer when the SDCARD is accessed during the daily cronjob. Indeed aside from a spike in CPU temperature, there appears to be nothing unusual about running the daily cronjob. The ntpd service on Clock #2 will occasionally complain about stale SHM data. This especially happens when radioclkd2 has has trouble decoding the pulses and has not written one for a while. In my estimation, this clock works as well as Clock #1 does, when the firmware crash isn't happening. It appears that the firmware in GlobalTop GPS module either crashes or otherwise stops sending serial data from time to time. When this happens the only thing that can be done is to reset the module. It does appear that the module will still respond to some commands and it is possible to connect to it with gtop_gps.pl and send command 104, PMTK_CMD_FULL_COLD_START followed by a /etc/rc.d/gtopgps start. It has been noted that the module would not produce most output messages, such as the one from command 414 PMTK_API_Q_NMEA_OUTPUT. I ended up writing a perl script that detects when this condition occurs and kicks the GPS module in that case.